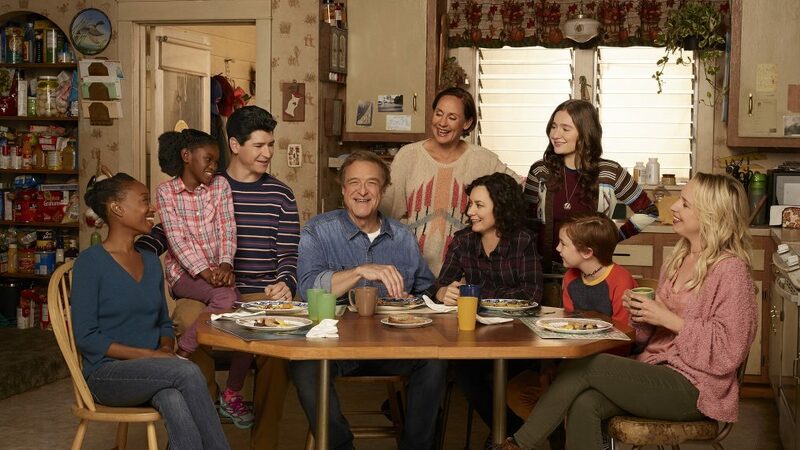 Since The Conners premiered this fall, many familiar faces from Roseanne have stopped by. And the November 27 episode, "One Flew Over the Conners' Nest," will bring another big reunion as Sarah Chalke returns! The actress, who starred as one of two Beckys in Roseanne's original run, returned for the short-lived revival, but this will be her first appearance in the spinoff series. According to the episode's logline, Chalke will return as her newer character Andrea, who was introduced in the revival. Executive producer Dave Caplan previews the new characters coming to Lanford this fall. Andrea entered the Conners' lives when Becky (Lecy Goranson) signed up to be her surrogate, but the deal fell through when it was revealed that Becky's eggs were old with little chance of conceiving. Ultimately, they went their separate ways, but it seems like all is well between the acquaintances in some newly released photos. At the Mexican restaurant where Becky works, Andrea is pushing a baby carriage, which we can only assume holds the baby she so desperately wanted in the revival. But Becky's not the only one there to welcome Andrea — she also has a run-in with Jackie (Laurie Metcalf) and Mark (Ames McNamara), as they appear to be leaving the restaurant as she's entering. Below see the new photos and mark your calendar for the reunion of Goranson and Chalke!